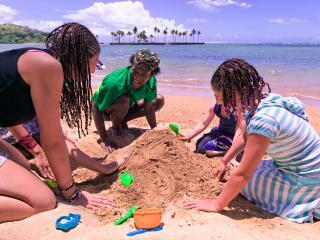 Need a special family holiday where the kids are not only welcome, but are kept entertained from the moment you arrive? These family friendly resorts specialise in catering for the whole tribe and provide an extensive range of Kid's Club activities, child minding services for the younger ones and for the older children activities such as water sports and adventure trips. Its why these resorts are Fiji's most popular with families of all ages. * Age limits apply, click resort names for more details. Naviti Resort is located on absolute beach front on Fiji's Coral Coast. Set on 38 acres of lush tropical gardens, accommodation is designed to cater for families with options available for families of up to 2 adults and 4 children. The fully supervised Kids Club is open 7 days a week catering for kids aged 5-12 years of age and includes jumping castles, puzzles and plenty of fun filled games and activities. Children under 5 years old can be supervised by baby sitters who are available from the Resort. Children under 15 stay & eat FREE (when in the same room as adults). With a FREE kids Club catering for kids aged 3 to 12 years old, your kids will be kept busy with a range of fun and educational activities. They will learn about Fiji's culture, have treasure hunts on the beach and even learn some Fijian language. For the adults totally relax by the amazing resort size lagoon pool or pamper yourself at Outriggers Bebe Spa with a massage or wellness treatment. The Sheraton Resort has undergone an amazing refurbishment which has transformed the resort into one of the most luxurious and beautifully appointed in Fiji. Kids are well catered for with child minding facilities and organized activities for the older kids. Kids under 12 years, stay and dine for FREE, giving you the freedom to use the kids club as often as your kids like. (Babysitting charges apply in some circumstances). Sheraton Denarau Villas give you all the facilities of the Resort, with the space and privacy of your own villa style home.